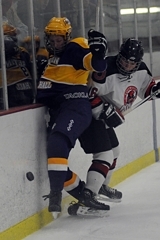 In a tight hockey game, penalties can make all the difference. 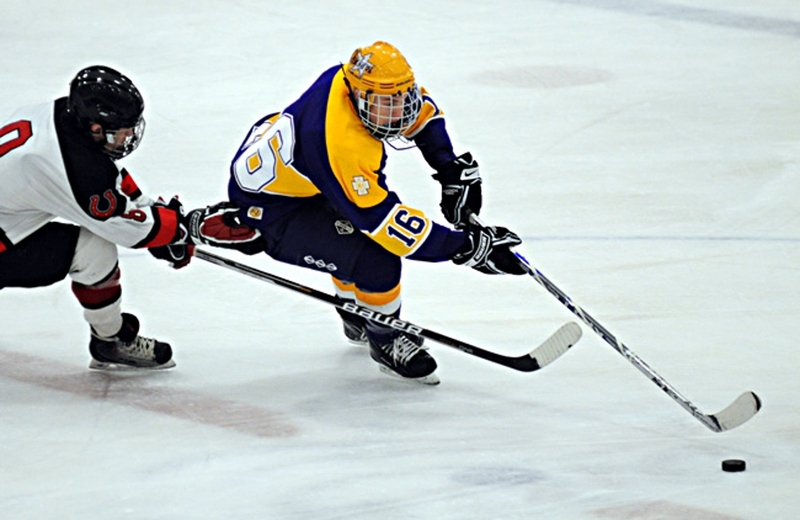 Cretin-Derham Hall scored three unanswered goals -- two on the power play -- to edge Stillwater, 3-1 in the semifinals of the Schwan Cup Silver Division at the Super Rink in Blaine. 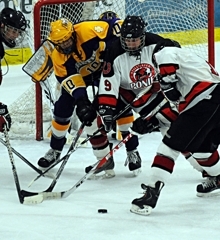 The Raiders (5-4-1) move on to the championship game 5:30 p.m. Saturday, Jan. 1 at the Xcel Energy Center against Holy Angels. 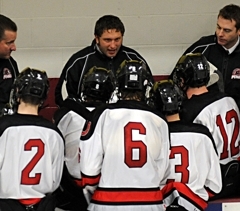 Barbato started the outburst with an even strength goal that tied the score at 1-all midway through the second period. Then the special teams went to work. 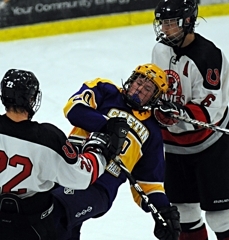 With four minutes left in the second, Stillwater’s Jordan Sitka was called for a five-minute major, giving Cretin an extended power play. 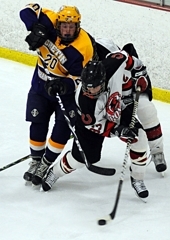 Tyller Robert took advantage just nine seconds later, ripping a shot from the blue line past Stillwater goaltender Blake Cates. 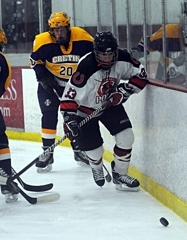 The Ponies managed to kill off the remainder of the penalty, but then early in the third sent Cretin on another man-advantage, which the Raiders' Dominic Nitti converted for a 3-1 lead. 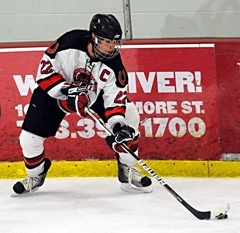 Stillwater (5-2-1) actually held a 1-0 lead on Sam Casey's power play tally until Kinne’s goal late in the second. 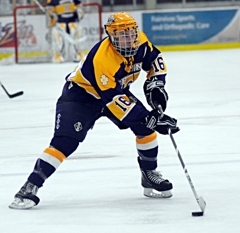 Cates flashed a quick glove hand several times and scrambled to keep the puck out of the net on a handful of Raiders’ scoring opportunities. He finished with 32 saves on 35 shots. 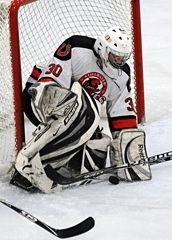 Joe Schneider made 17 saves for the Raiders. 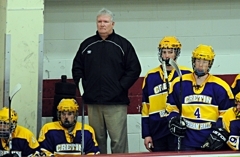 It was Cretin's second victory this season over their Suburban East Conference rivals. Back in early December, the Raiders took a 5-4 decision. But shortly after that victory, O'Neill's club went into a bit of a tailspin, losing four straight games entering the holidays. 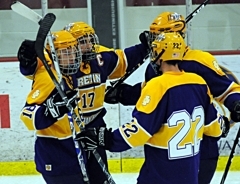 They have recovered nicely in the Schwan Cup, defeating Lakeville South in the quarterfinals and Stillwater in the semis. 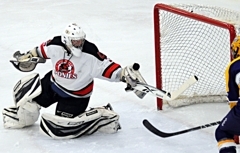 “We started moving the puck a lot better, using each other and we also tried to pick up our physical game a little bit,” said Robert, who called a 7-1 loss to White Bear Lake on Dec. 18 an eye opener. Stillwater was playing without coach Phil Housley, who is assisting with Team USA in the World Juniors tournament in Buffalo, N.Y. 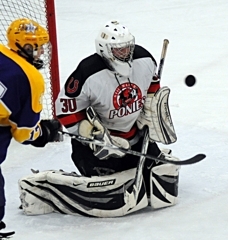 The Ponies will play in the third place game Friday, Dec. 31 at 7:30 p.m. at the Super Rink against Blake. 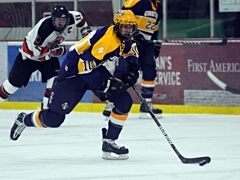 Robert, a senior defenseman, notched the game-winner on the power play late in the second period. 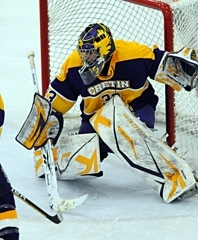 Just nine seconds into a five-minute major, he ripped a shot from the blue line that eluded Cates and gave Cretin its first lead of the game. It might seem odd to name the losing goaltender as the second star, but Cates was stellar in nets as he kept the Ponies in the game. Cates had several sprawling saves over the first period and a half, allowing Stillwater to hold a 1-0 lead. He finished with 32 saves. 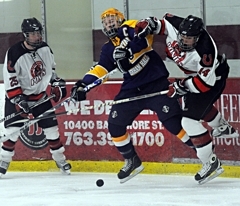 Barbato, a senior forward, picked up a goal and assisted on Dominic Nitti's third period tally. Barbato didn't have much room to operate against Stillwater's tight-checking defense, but he made the most of his chances.